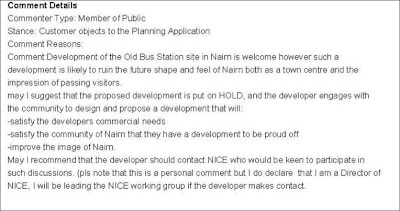 Two extracts from comments submitted to the planning department and now available on their website. The first is from Jimmy Ferguson and he writes as an individual not a director of NICE. This observer would contend that the majority of NICEites would perhaps be behind him however given the show of hands from them at the public meeting on Friday. Contrast that with the short and sweet submission below from Tommy Hogg on the behalf of River Community Council. Now their decision was unanimous. 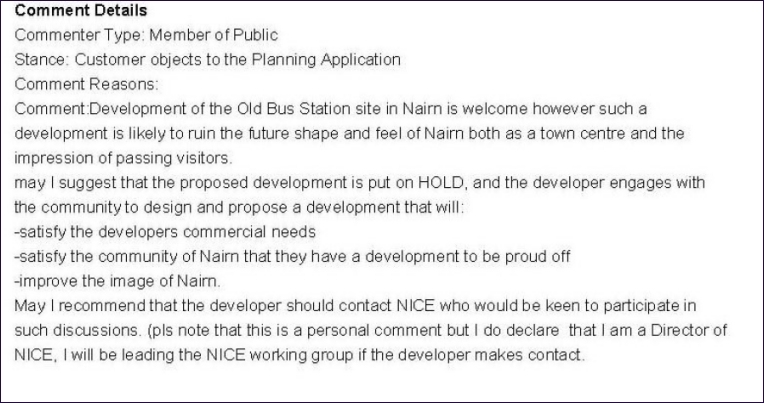 There lies the division of opinion in Nairn on the bus station planning application. NICE's ambition is to speak on the behalf of the Community and River Community's role is to represent the Community. So we have two views on the behalf of the Community. Can they both be right? This obsever would contend that River CC are closer to public thinking here - based on the unscientific poll held recently on the Gurn. Over now to the planning professionals and the elected councillors on the Committee - the majority of whom that will debate the proposal will not of course be from Nairnshire. You can see other submissions on this planning application here.